Once the short and stocky defenders of mountain fortresses, civilized dwarves have long abandoned their warrior ways trading swords for plowshares. The dwarves of the Great Kingdom of Jaxstein have utilized dwarven engineering and magic to create farmland high in the mountain valleys to become almost completely self-sufficient. This has allowed them to grow rich on their exports and found an international bank. In doing so, they have bought the freedom of neutrality and the privacy from outsiders. Dwarven adventurers are young, seeking out glory after coming of age. Dwarves are a short and stocky race, and stand roughly a foot shorter than most humans, with wide bodies that account for their burly appearance. Male dwarves pride themselves on the long length of their beard and often decorate their beards with a variety of clasps and intricate braids. Clean-shavenness on a male dwarf is a sure sign of madness, or worse, dishonor. Having his beard shaved off is the worst punishment a male dwarf can receive. Female dwarves are often believed to also have beards. While once true, this practice has fallen out of fashion with most civilized dwarves. Some rural farmers or barbarians still do have beards, but it is more of a quaint rarity these days. Dwarves can have a wide range of hair color, from blonde to black with white hair being common among older dwarves. Society: There is one dwarven kingdom and it is the greatest of all, Jaxstein. Jaxstein is a mountainous region of tall peaks and lush valleys. The passes are winding, treacherous, and picturesque. The dwarves live on the peaks, carving out towns and terraces for farming. In the valleys they build towns and raise livestock. Hard labor and dwarven magic have allowed them to become almost completely self-sufficient and they are proud of this fact. They would rather keep what they have built than risk it on wars and politics. 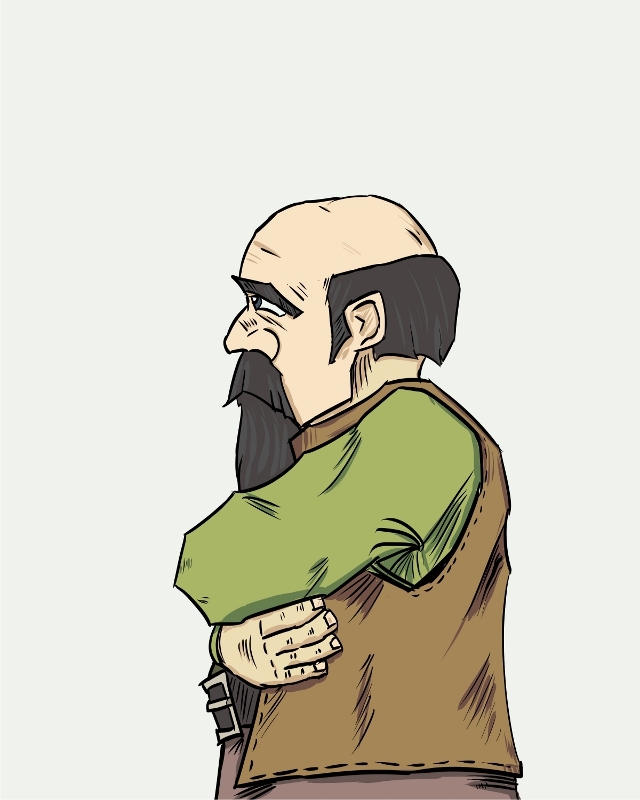 Relations: The dwarves of Jaxstein are, in general, isolationists. They enjoy the place they have carved out in the world and seek to keep it safe. Though untrusting of outsiders, they have learned that they make good customers. The dwarven self-reliance that has grown up has afforded the kingdom the luxury of exporting more than they import. The surplus of wealth from this has allowed the dwarves to open up the Bank of Jax, the first international bank. In doing so, they have crafted a place of neutrality in political matters, which is just how they want it. Alignment and Religion: Dwarves are driven by pride and honor. While they are often stereotyped as standoffish, they have a strong sense of friendship and fierce work ethic. Those who win their trust understand that while they work hard, they play even harder—especially when good ale is involved. Most dwarves are neutral good, preferring to keep the peace rather than enforce laws. Jax is the patron god of dwarves. Adventurers: Although dwarven adventurers are rare compared to humans, they can be found in most regions of the world. Dwarves often leave the confines of their redoubts to seek glory in their youth before returning home to settle down and raise a family. In Chronicle, there are some differences between the races and their Pathfinder Core Rulebook counterparts. Presented below is the Dwarf Race entry for the Chronicle Campaign Setting. Languages: Dwarves begin play speaking Common and Dwarven. Dwarves with high Intelligence scores can choose from the following: Giant, Gnome, Goblin, Orc, Terran, and Undercommon. Mountaineer: Dwarves are skilled at climbing and navigating narrow ledges. Dwarves with this racial trait are immune to altitude sickness and do not lose their Dexterity bonus to AC when making Climb or Acrobatics checks to cross narrow or slippery surfaces. Craftsman: Dwarves are known for their superior craftsmanship and fierce work ethic. Dwarves with this racial trait receive a +2 racial bonus on all Craft or Profession checks. Rock Stepper: Dwarves with this racial trait can skillfully negotiate rocky terrain. They can ignore difficult terrain created by rubble, broken ground, or steep stairs when they take a 5-foot step. Shrewd: Dwarves gain a +2 racial bonus on Appraise checks made to determine the price of non-magical goods.